How to draft a Missed Appointment Letter? An easy way to start completing your document is to download thisMissed Appointment Letter in Word template now! Every day brings new projects, emails, documents, and task lists, and often it is not that different from the work you have done before. Many of our day-to-day tasks are similar to something we have done before. Don't reinvent the wheel every time you start to work on something new! Instead, we provide this standardized Missed Appointment Letter in Word template with text and formatting as a starting point to help professionalize the way you are working. Our private, business and legal document templates are regularly screened by professionals. If time or quality is of the essence, this ready-made template can help you to save time and to focus on the topics that really matter! Using this document template guarantees you will save time, cost and efforts! It comes in Microsoft Office format, is ready to be tailored to your personal needs. Completing your document has never been easier! 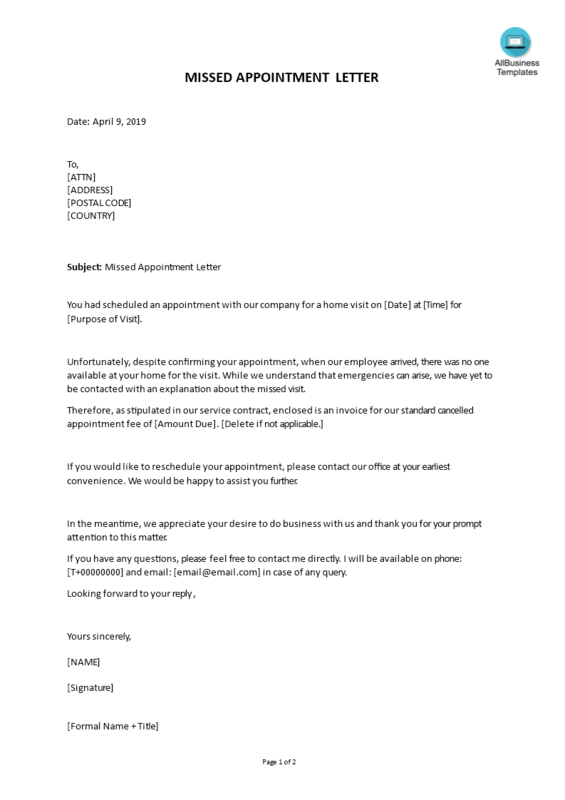 Download this Missed Appointment Letter in Word template now for your own benefit! This template will perfectly suit your needs! And after downloading you can craft and customize every detail of its appearance very quickly. You had scheduled an appointment with our company for a home visit on [Date] at [Time] for [Purpose of Visit]..